So, in this case, what I wanna show in this post is how you can develop and deploy a simple JAVA app (.JSP and SERVLET app) into Windows Azure (I’ll show it into the Windows Azure local Dev-Fabric but also into the real Windows Azure cloud in the Internet). Regarding base software installation (Java, Tomcat & Eclipse), it is critical that you install versions that match each other, especially talking about the processor version (x86 or x64). In my case, all versions that I installed are x86 (Even though my Windows 7 is a x64 version, there’s no problem with that). 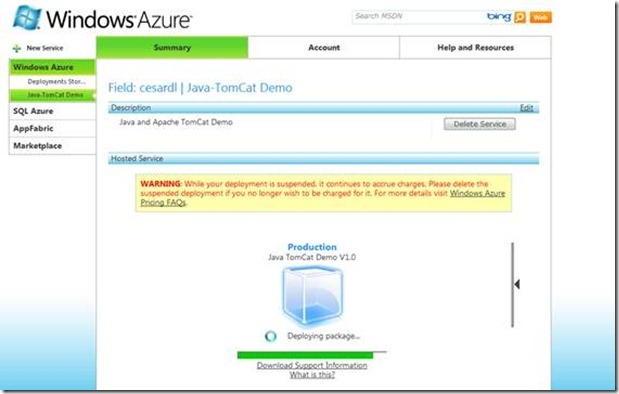 Do not install the ‘32-bit/64-bit Windows Service Installer’, as this is the TomCat Windows Service version, and you won’t be able to deploy a Windows/NT Service in Windows Azure PaaS. We need the ‘process/command’ version of Apache Tomcat. Then, just unzip Tomcat in your selected directory. – But in this case I just want to run a standard and simple JSP and SERVLET App. – Import PrintWriter option using the rightClick mouse context. o Destination, in my case: E:\JavaEnv\apache-tomcat-6.0.29-windows-x86\webapps –> and ROOT.WAR as my filename, so it will run as default webapp. – OK, so our Java app is running now on a regular Apache TomCat (In a Apache Command process). – Buildme.cmd creates/builds our solution. In this step we’ll need to provide the Apache-tomcat path, and the Java runtime path. It gives us complete control as we can deploy any particular Tomcat or Java runtime version. – The Runme.cmd command deploys and runs our app and base software into Windows Azure DEVELOPMENT fabric. It moves Tomcat and Java runtime into WA dev-fabric local storage, and also, our app. – Next thing we need to to is to configure TomCat to listen in the right TCP port. In WA we have a load-balancer for all our VM instances, but we need to run Tomcat in any other port than port 80. We need to configure it so the Load-Balancer can ‘talk’ to TomCat. – Next thing we need to do is to start TomCat Service. – And finally it’s going to monitor TomCat, so if for some reason TomCat crashes, then WA will be notified and we can re-start a WE node, etc. – The Buildme.cmd batch file which is available in the root folder of the solution generates the CSX folder. This batch file should be executed only from the Windows Azure SDK command prompt. On executing this, it checks if the Tomcat and Java binaries are present in the required directories. If not, it prompts for the path to the binaries and the user needs to give the path to the binaries folder (for e.g. E:\Binaries\Tomcat). On a successful build, it generates the CSX folder under the root folder of the solution. This is required to run the solution in development fabric. – Next step would be uploading our app to Windows Azure cloud in the Internet. – The Packme.cmd batch file which is available in the root folder of the solution generates the Tomcat.cspkg for the solution under the root folder itself. This batch file should be executed only from the Windows Azure SDK command prompt. . This package along with the service configuration file (.cscfg) is used for deploying the solution on the cloud. The package file and service configuration file are required to deploy the solution on cloud. Once the package is deployed on cloud, the application can be accessed via the following URLs. – NOTE: The ServiceDefinition.csdef and ServiceConfiguration.cscfg files should be kept under the root folder of solution for the Buildme.cmd, Packme.cmd and Runme.cmd to execute properly. So if any change has been done to these files in the solution, the latest should be copied to the root folder too. – Take into account that because of we need to upload JRE & TomCat, our app’s package is quite heavy (around 56 Mb), and therefore, deployment upload will take long. One workaround for that is uploading it just once to a Windows Azure BLOB and then we can deploy it from there much faster (in case we delete/upload same app’s version many times). – COOL!. Now you could try with any other Java-TomCat App. (Web-Service, etc.). eBay’s page for iPad listings — http://ipad.ebay.com— (hosted on the public Windows Azure platform). You may need iPad to view the page.